Nearly one in 17 Americans (ages 40 and older) visits a doctor each year due to knee pain. That's a lot of nagging knees. We see patients with knee pain frequently in our office at Texas Orthopedics. This common and painful wear and tear on the knee joint is often associated with an inflammatory condition such as osteoarthritis, or even more typical, obesity. As the majority of the population continues to age, and unfortunately still remain overweight, instances of knee pain are at an all-time high. To pinpoint the exact cause of any knee pain, many think that an MRI, or some other sophisticated screening/technology, is necessary. New research shows that plain, old X-Rays are the best way to diagnose common knee pain in those over 40. The September issue of the Journal of the American Academy of Orthopaedic Surgeons (AAOS) featured a study that looked at 100 MRIs of knees from patients aged 40 and older. The surprising find was that only half of those MRIs performed prior to meeting with an orthopaedic surgeon actually contributed to a patient’s diagnosis and treatment, especially as related to osteoarthritis. 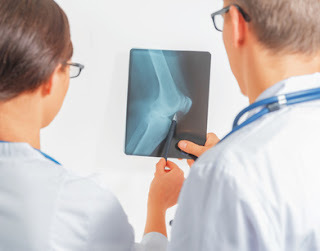 The study recommends that an X-Ray should always be the first line of screening for minor to moderate knee pain, especially if thought to be associated with an arthritic condition or excess pressure on the joint from being overweight. X-Rays are also much more efficient and cost-friendly, to both the patient and medical provider, as compared with an MRI. If you have a nagging knee issue that you’d like to get checked out, please contact us for an appointment.